Are your whites really white? - AND can you tell? The incandescent bulb that is now disappearing gave us great color rendering. So now we are familiarizing ourselves with the newer LED options. But no two LEDs are created equal. Some have wonderful color rendering, others make their surroundings look drab. Lots of products are manufactured with optical brighteners that look terrific under incandescent light, but unfortunately not under conventional blue-based LED lamps. Whites look a dingy, yellowish gray. So here I thought that all I needed to look for was a high CRI (Color Rendering Index) # on the box and everything would look great. But while testing different LEDs we saw for ourselves that this is not the case. Even a lot of LEDs with a very high CRI failed at rendering whiteness properly. After testing a lot of LED lamps we are blown away by one brand: Soraa. 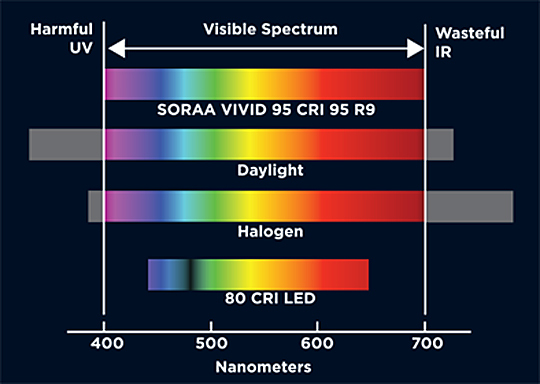 Soraa’s GaN-on-GaN technology is engineered to render white materials with optical brighteners in exactly the same way as natural incandescence. So now white looks white, from the beautiful wedding dress, to refrigerators, crisp white linens and paper.